Two of Coventry’s sporting celebrities performed the draw for Rugby League’s Coral Challenge Cup – at the city’s historic St Mary’s Guildhall. Para-athlete and 2018 BBC Young Sports Personality of the Year, Kare Adenegan - who is also the patron for Coventry’s year as European City of Sport - was joined by David Moorcroft OBE, the former 5,000m World Record holder, for the draw, which was shown live on the BBC Sport website last night. The draw featured 24 teams, including the Coventry Bears, who were handed a tough away tie at Doncaster. Other ties included Newcastle Thunder v West Wales Raiders, London Skolars v North Wales Crusaders. The third-round ties will be played over 9-10 March. The draw came just days after it was confirmed that Coventry would be a host city for a game in the Rugby League World Cup in 2021. A number of guests from the city, Coventry Bears, the City Council and community clubs will be in attendance at St Mary’s Guildhall to celebrate the occasion. Councillor Kamran Caan, Cabinet member for Public Health and Sport, said: “We were honoured to host the Coral Challenge Cup at our wonderful St Mary’s Guildhall. 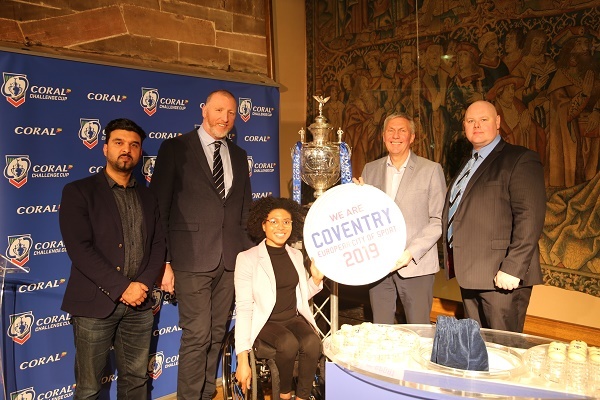 “Rugby League and the Coventry Bears are a part of our rich sporting life that has seen us honoured with the title of European City of Sport and events like this help to raise our city’s profile and put us on the sporting map where we belong. Coventry Bears will open their 2019 Betfred League 1 campaign against West Wales Raiders on Sunday (17 February), with a 3pm kick-off. To see the full Third Round draw, visit the website.